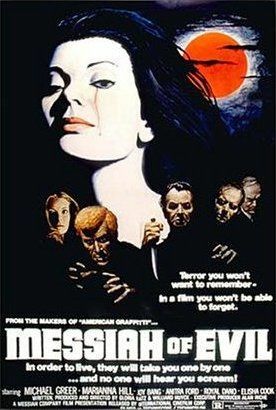 "Messiah of Evil (later also shown under the title Dead People) is a film made in 1973 by Willard Huyck and Gloria Katz, the husband and wife team behind the film version of Howard the Duck as well as the screenplay for American Graffiti." From the movie: "They say that nightmares are dreams perverted. I told them here it wasn't a nightmare--but they don't believe me. They nod, and make little notes in my file...But there's so little time left! You've GOT to listen! "They're coming here...they're waiting to pierce the city. They're peering around buildings at night, and they're waiting...They're waiting for you. And they'll take you...one by one, and no one will hear you scream! NO ONE WILL HEAR YOU SCREAM!"